Ivan Ramen Slurp Shop in Gotham West won both me and Jonathan over. The Barista at Blue Bottle Coffee Co. got such a kick out of me when I was trying to tell him about our magical ramen discovery when I was ordering coffee the next morning. This Ramen aha moment wouldn't have happened if it weren't for my long time social media friends, Jackie and Margaret, who took us there. I don't want to be sappy but I dig these two ladies. I've known Jackie and Margaret for four years now but met them for the first time in real life this past weekend. It felt as if we were long time friends. Lo and behold, as it turns out, Ivan Ramen has a couple of successful outposts in Tokyo, Japan, where Ivan Ramen began. His Slurp Shop counter in Gotham West is his first in NYC with the much anticipated restaurant on Clinton Street opening soon. For years we really tried to love ramen. I even convinced myself that some were the best ramen we ever had. At the time, it was true when I wrote it. 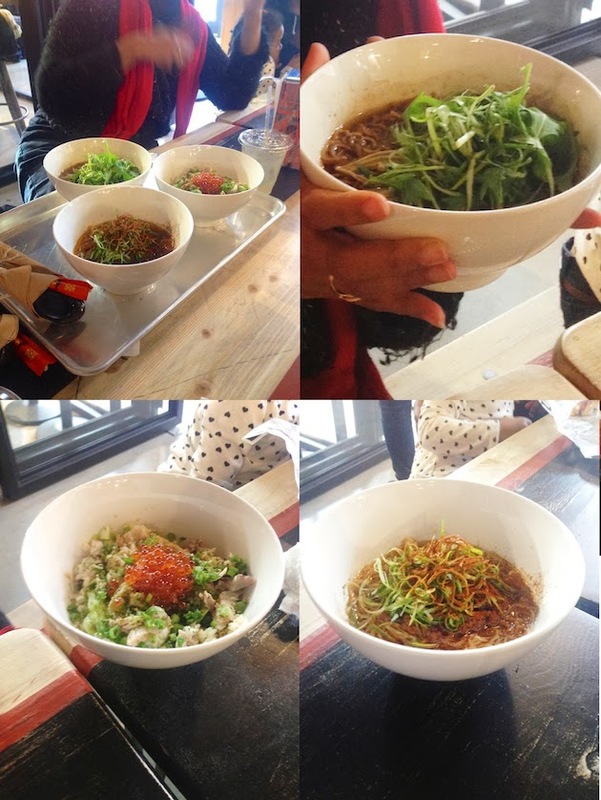 Problem was even the best ramen we ever had before this weekend didn't sweep us off our feet, only left us satisfied. It didn't keep us coming back. We indifferently surrendered to the notion that Japanese ramen and us wouldn't ever indulge in a long term affair. Our encounters, short stints here and there.That is until our trip to NYC this past Thanksgiving weekend. Margaret, who is a chef and knows Asian food well, said that the rye noodles are unique. No one in the city, to her knowledge, does them but Ivan Ramen. It must be that the distinctly subtle rye that really spoke to us, but the Vegetarian Shoyu with vegetables broth, soy and enoki mushrooms was equally as sensational. The Chili Eggplant Mazemen was delicious with just enough of a kick. A different flavor profile than the Vegetarian Shoyu. The bowl was more like a chili, soy and vegetable sauce coating the rye noodles rather than a soup. Jackie, a singing chef, who always thinks outside the box, ordered a Jewish/Japanese hybrid of a dish. Smoked Whitefish Donburi with salmon roe, sweet soy dash, cucumber and scallion. Composition and presentation of all three bowls was stunning which made it all the more appetizing. We interrupted Ivan, who was engaged in a conversation with a couple of guys, but he was super gracious regardless. Turns out he's got a cookbook/memoir out, titled Ivan Ramen, naturally. Now that ramen won me over, I have to work on my slurping, for when I come back for more rye noodles. Photos in this post were snapped with my iPhone. Follow my NYC eats on Instagram. I've got to try this place - love ramen and have been wanting to go to a ramen noodle shop for a long time. Thanks for sharing your experience!